Wonderful gift.. I love house paintings. Wow! I've been a follower for some time yet didn't know you did this. What would you need to paint a portrait of our house? And what is the price? Oops! My first comment was just deleted. 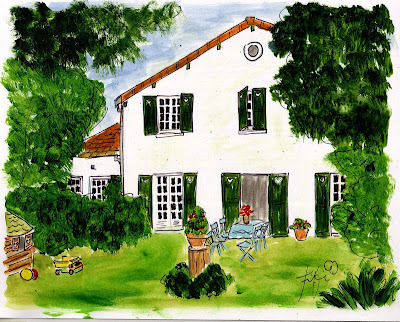 I am thrilled that you paint portraits of homes. Please let me have more information: Do you do it from a single photograph or do you prefer several angles? What are your prices? your painting is so much more beautiful than the photograph! Your painting makes the house look better than it is! hehe!